(From the Office of the Mayor) Mayor Edwin M. Lee today announced the nomination of Joel Ramos to the Board of Supervisors to serve on the San Francisco Municipal Transportation Agency (SFMTA) Board of Directors. Under the Charter, the Board of Supervisors has the authority to review and confirm the Mayor’s nominees to the SFMTA Board. 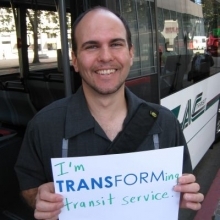 Ramos currently is a Community Planner at TransForm, engaging low-income and minority communities around Bus Rapid Transit (BRT), better transit and more affordable housing in Transit Oriented Development (TOD) in the Bay Area. He assists the City of Oakland and community stakeholders in community awareness efforts for projects including the Lake Merritt BART Station and the International Boulevard Transit Oriented Development. Prior to TransForm, Ramos was the Community Organizer for the Center on Policy Initiatives in San Diego where he organized and facilitated a coalition made up of labor, social justice, and environmental advocate groups to win a Community Benefits Agreement for a major Transit Oriented Development Project. His work resulted in the construction of hundreds of affordable housing units, living wage jobs and green building construction at an inner-city transit hub (now called the “Ballpark Village Community Benefits Agreement”). Ramos has been a member of the Geary Boulevard BRT Community Advisory Committee since 2008. He is an active member of the San Francisco Planning and Urban Research Association (SPUR). A lifelong transit rider, Ramos holds a Bachelor’s of Art in Geography with an emphasis in City Planning from San Francisco State University. Congratulations Joel! I couldn't think of a better candidate, looking forward to seeing your service on the Board.